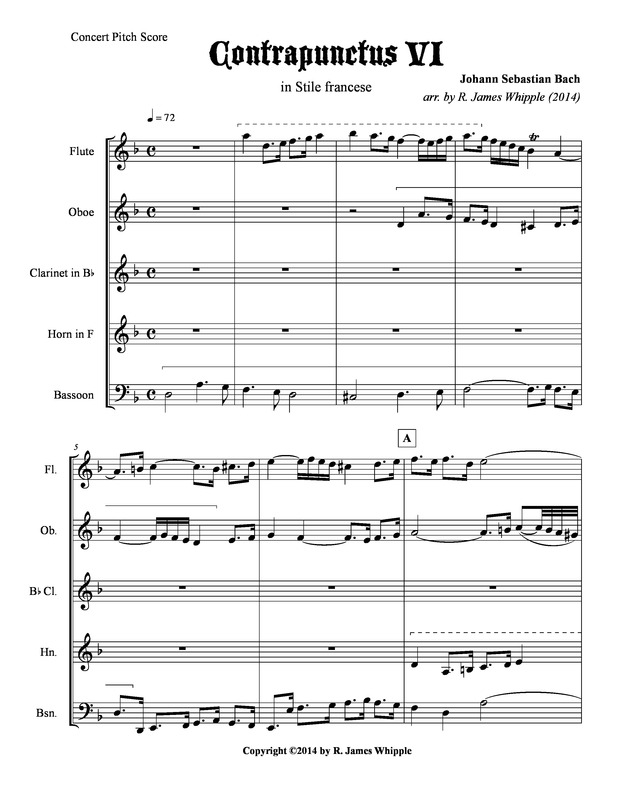 The latest addition to the Winds’ repertoire this month is Contrapunctus VI from The Art of Fugue by J.S. Bach, in a brand new transcription for wind quintet by composer/bassoonist R. James Whipple. In this amazing piece, Bach casts the theme (the “subject”) against itself moving twice as fast, and often upside-down (“inverted”)! It’s pretty wild to hear one part enter after another but finish first! And this isn’t all; there’s a direction that the piece is to be performed in “French overture” style, so all the dotted rhythms become “doubly-dotted” which means that the short notes are twice as fast! You can hear this amazing creation on the Winds’ concerts on Saturday and Sunday, May 17-18. Here’s what the first page looks like (the dashed brackets show where the theme is inverted).